President Niyazov was mad, bad and dangerous to know – ruler of Turkmenistan from the fall of the Soviet Union until his death just before Christmas 2006 – and known as Turkmenbashi (= ‘Head of all Turkmens’). I posted about that event a bit as it happened. But he’s reappeared on my radar this week for a couple of reasons. I have been preaching on early chapters of Daniel on Sunday evenings. Last Sunday we were in Daniel 3 and the famous burning fiery furnace. But the subject of the is not so much the 3 brave faithfuls, Meshach, Shadrach and Abednego – but the despotic king, Nebuchadnezzar and the effect that these 3 had on him. And Niyazov is (if practically nothing else) a gift for preachers of Daniel 3. 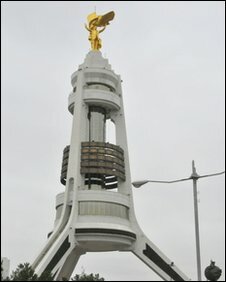 I used a number of pictures in the talk of some of the countless gold statues of himself around the country – of which this image is the most notorious: the Neutrality Arch, surmounted by a gold image of Niyazov that rotates every 24 hours in order to face the sun. Who says the OT is outdated and out of touch? Just as Nebuchadnezzar’s dream in Daniel 2 confirmed, empires rise and empires fall – ’twas ever thus and ever will be. The curse of Ozymandias strikes again. so would Percy Bysshe have once spelled his name Bish – or have you changed yours? !